The Horizon School was established in the year 2008 by The Horizon Society and is a co-educational, senior secondary school affiliated to CBSE New Delhi. 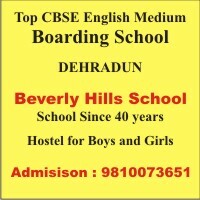 The school is located at Jolly Grant, which is 26 km from Dehra Dun city. The school has a campus of 5.5 acres and is located in lush green surroundings with the Thano range of reserve forests at its north adding to the charm. The school has spacious classrooms and big playgrounds.